“Faint Hope for Astronauts: In Search of Solutions to Orthostatic Intolerance” will be presented by Andrew Blaber, Simon Fraser University in Canada at 11 a.m. Tuesday, April 17, 9n 210 Clifford Hall. Post-spaceflight orthostatic intolerance and postural deficiency remain a major concern for human missions involving extended durations of weightlessness. The effects are the result of multisystem adaptation to the loss of gravitational influence. Dr. Blaber will discuss his 25 years of investigating responses to spaceflight. These studies have provided considerable insight to our understanding of human cardiovascular physiology. His data from over 50 astronauts (Shuttle and ISS) showed that cerebral autoregulation can be impaired post-flight and lead to syncope. Based on his observations of returning astronauts he postulated a cardiovascular and postural control interaction and has now identified the skeletal muscle pump as the link. This muscle pump baroreflex plays a significant role in blood pressure regulation during standing. In a study completed this year, his team found significant impairment of the reflex. Current efforts are now underway to implement these findings in new inflight training and countermeasures designs. These new observations have also opened a window for better assessment, monitoring and treatment of cardiovascular and postural disorders on Earth associated with aging, concussion, and Multiple Sclerosis. Andrew Blaber has a BSc (Marine Biology, 1984) and MSc (Biophysics, 1986) from the University of Guelph and a BEd (Physics/Biology, 1988) from the University of Western Ontario. After a brief stint as a high school teacher, he returned to academia and received his PhD in Kinesiology at the University of Waterloo (1994). His postdoctoral work was in the area of cerebral autoregulation in astronauts under the direction of Dr. Roberta Bondar at the University of Western Ontario. 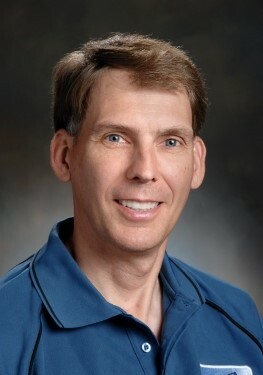 In 1997 he received a faculty position at Simon Fraser University (Burnaby, BC, Canada), where he is the director of the Aerospace Physiology Laboratory. Blaber has over 70 publications in the field of human spaceflight physiology and routinely works with the Canadian and European space agencies as well as NASA. He has appeared in news and documentary shows on CBC, CTV, Global TV and Discovery Channel. His current research is focused on an integrated approach to the problem of syncope and falls, particularly with respect to aging, and space flight. His current research model includes the use of prolonged bed rest and short-arm human centrifuges. He is investigating several homeostatic mechanisms related to the maintenance of blood pressure during orthostatic challenge. To the well known arterial and vascular components of the baroreflex, he has now identified a third component, the skeletal muscle pump baroreflex, regulated via the postural control system. This new cardio-postural model has provided a more complete understanding syncope in humans.